I'm writing on behalf of Candy Dungan, our well-known friend, skate mentor, fiance, and mother, who recently experienced a traumatic incident involving a guardrail and suffered an injury to her spine. I'm writing to downhill skateboarders across the world. Some of you have had the privilege to meet Candy in person, some of you may have just connected with her through Facebook. But, as many of you know, the USA does not provide health care to their citizens, and medical costs are exceedingly expensive, especially when it comes to critical care. Candy is an extremely hard working individual with three different jobs to support herself and her skate career, however none of them yield health care benefits. We all love Candy, and she has done so much for the skate community. We want her to focus on her recovery right now, the last thing that she needs to be worried about is her financial situation. All money from this fundraiser will go directly to Candy for medical expenses and living expenses through her recovery. Thank you. I want to start by saying thank you from the bottom of Candys heart. Her entire family is eternally grateful for all of the donations, big and small. One of the first nights the Go Fund Me was created, we imagined a map of the world lighting up like the night sky with all of the different people across many countries and continents who were thinking about Candy. This support has helped carry her through this trying time, and will continue to help her. Candy has officially moved to Craigs Hospital, a world-renowned spinal rehabilitation facility in Denver, and will continue her treatment with the best care possible. This is HUGE! Because it means Candy is going to get medical attention that mirrors the type of athlete she is - the BEST of the BEST, with doctors that possess equal passion. So thank you again for all that have helped her and reached out. The purpose of this update is not only to inform you of Candys current condition, but to also inform you that Mindy, Candys mother, has set up a Trust account that will receive the funds directly from this campaign. The intent of the Candice Dungan Special Needs Trust is to create a purely discretionary supplemental care fund for the benefit of Candice Dungan and not to displace financial assistance that may otherwise be available to her. It is important that the Beneficiary (Candice Dungan) maintain a high level of human dignity and that her care be humane. In addition, to maintain Candice’s health, safety and well being. I will continue to update the GoFundMe with her progress, which Candy has been documenting through Facebook status'. She is very busy throughout the day with therapy, but is still taking visitors in the evening! This outpouring of emotional and financial support has been nothing short of incredible, and we can't thank you enough for being a part of it. April 1st update: Candy has her pain under control and got into the wheelchair for the first time!! She's already ripping laps around the hospital. PT & OT started today, keep sending love! 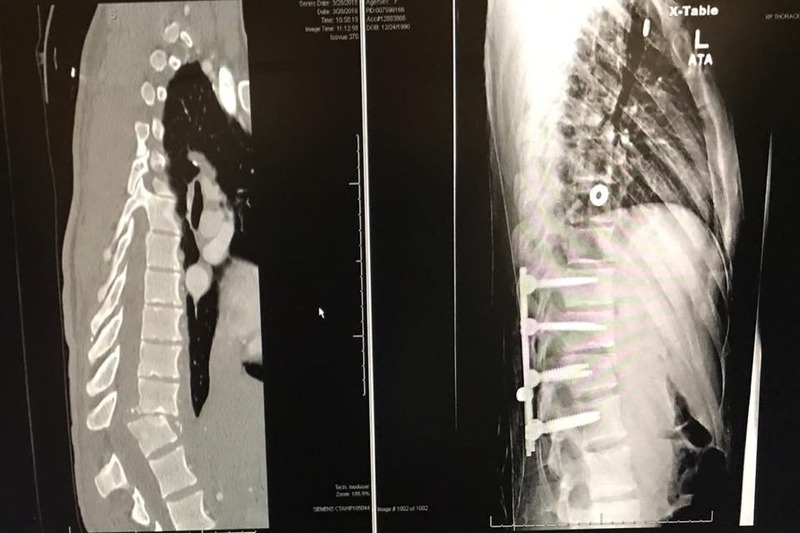 March 30th Update: Surgery went absolutely amazing, the alignment is perfect! She was dubbed the "overachiever" by all the doctors yesterday for sitting up in a chair just hours after surgery! She is already regaining some feeling along her hips and has even made a toe flinch with high concentration! She will start PT here at UCHealth in Colorado Springs until a space opens up at Craig Rehab Center in Denver(one of the best spinal rehab centers in the nation!) Candy is in good spirits and we have high hopes for recovery! Thank you to everyone for everything, your support has meant the world to both Candy and I. March 29 update: Candy’s surgery took only 3 hours instead of an expected 10 - 12 hours.. The surgeons fused her spine between the 10th Thoracic (T10) and 2nd Lumbar (L2) vertebrae. It will take time for Candy’s rehab potential to clarify, but the encouraging verdict is that "it’s not impossible that she may walk again”! She has also been deemed a perfect candidate to be transferred to Craig Hospital in Denver – one of the world’s top spinal rehab facilities. If all goes well, she’ll be there as soon as April 1, Easter Sunday. The surgeons had to reposition and fuse displaced / fractured vertebrae, which were pinching her spinal cord. However, they were unable to actually see the cord, which is very positive news. It means that the cord was still inside the vertebrae, probably not fully severed, and enveloped by an intact membrane, with no spinal fluid leaking. The prospects for healing are much better in this scenario. Thanks to everyone for your kind words, encouragement and support.